The kind of warfare that was waged in the inland waters of South Vietnam was last practiced by the U.S. Navy during the Civil War. As result, much of the tactics were developed by trial and error. Sailors learned their lessons well and became a formidable fighting force that wrestled control of the water ways from the Viet Cong (VC) and the North Vietnamese Army (NVA). 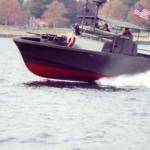 No boat came to symbolize the Brown Water Navy like the small fragile River Patrol Boat (PBR) of Task Force 116 (T.F. 116), code named “Game Warden”. The sailors who manned the PBRs often fought pitched battles with the VC and NVA at ranges of mere feet. 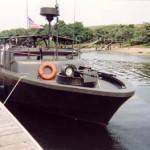 When the Navy decided to commit river patrol forces to the inland waters of Vietnam, it found itself in need of a small fast patrol craft. The result was the PBR MK I. The boat was 31 feet long and capable of speeds approaching 25 knots. It was powered by two GM 220 Horsepower diesel engines connected by direct drive to a pair of Jacuzzi water jet propulsion pumps. 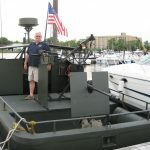 The boat’s armament consisted of a twin 50 Caliber machine gun mount in the forward gun tub, a single 50 Caliber machine gun on a stern mount, an M60 machine gun and a Honeywell MK 18 40mm grenade launcher mounted amid ship. In addition, each boat was equipped with various small arms; M-79 grenade launcher, shotgun, mortar, grenades and side arms. The PBR was outfitted with a Raytheon 1900 radar unit and two AN/VRC 46 radios. The PBR drew only two feet of water while at rest and about nine inches of water at full speed. After the initial run of MK I PBRs, the MK II was introduced. Slightly larger and faster and with a lower profile, the only significant difference was the beefed up aluminum gunwales to aid in protecting the boat from being damaged when coming alongside sampans and junks. Eventually there would be 250 PBRs in Vietnam. The PBR was manned by a four man crew – normally a First Class Petty Officer as boat captain, a gunner’s mate, an engineman and a seaman. Each crewman was cross-trained in each other’s job in the event one became unable to carry out his duties. Generally PBRs operated in two boat patrols under the command of a patrol officer who rode one of the boats in addition to the normal crew. The sailors who took on the VC in his own territory and on his short range terms, and beat him, became a force without precedence in the history of the U.S. Navy. Enormous responsibility and demands were placed on the PBR sailors, especially the Boat Captain. PBRs logged up to 70,000 patrol hours in an average month with the PBRs being in approximately 80 firefights per month. At one time, the casualty rate ran at about 6% per month. At that rate and over a year’s tour, nearly three out of four PBR sailors could be expected to be killed or wounded. Individual River Divisions sustained casualty rates far higher for short periods of time. As an example, River Division 531 suffered B-40 Rocket hits to 7 of the 10 assigned boats in a period of only 40 days. During the overall period of the PBR in Vietnam, 1 out of 3 PBR sailors were killed or wounded. The PBR Sailors became the most highly decorated naval command of the war with two recipients of the Medal of Honor, fourteen recipients of the Navy Cross and recipients of untold numbers of Silver Stars, Bronze Stars and Purple Hearts. Today, many old sailors wear the Vietnam service medal. Of these, only a small portion served in the River Patrol Force. And in a sense, these men are a group unto themselves. Their uniforms were not white or even blue denim, but jungle fatigues. And rather than the traditional white hat, they wore the distinctive head gear that only those who served with the River Patrol Force were permitted to wear. These sailors proudly wore the Black Beret. • Five U.S. Navy ships were named after five PBR Forces sailors who were killed in Vietnam. • One U.S. Navy ship named after the passing of Medal of Honor recipient BM1 James Elliot Williams. 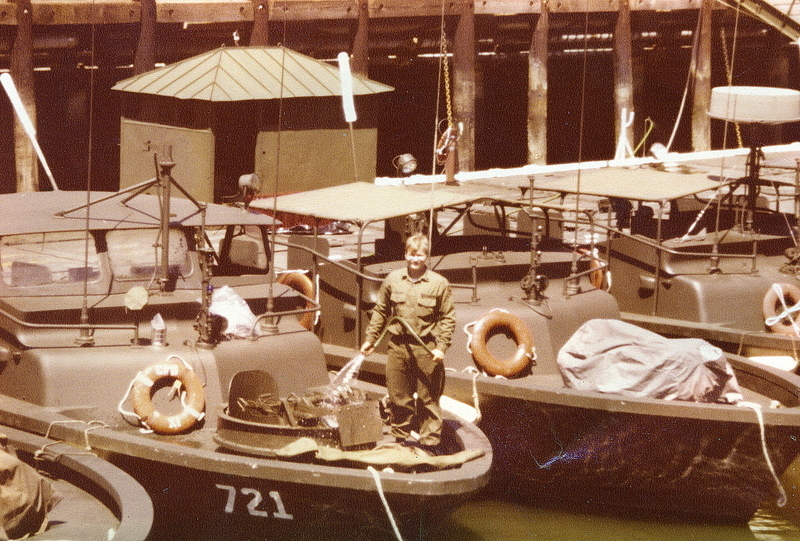 Note: These heavily armed craft were developed for riverine warfare in Vietnam. As you should be very proud. Dangerous missions. And thanks for your message and please stay in touch!